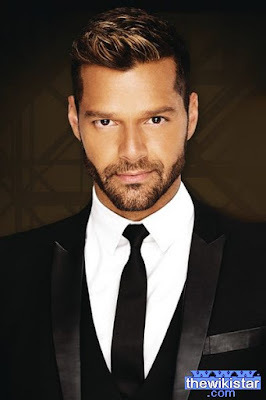 Ricky Martin, is a Puerto Rican pop singer, born December 24, 1971 in Puerto Rico. Ricky Martin was born on December 24, 1971 in Puerto Rico. It is a leading Latin music and loved by all the fans around the world to understand the innate rhythm and passion for performance equal and compassion in the tender, and has worked on stage and in the TV screen in Mexico, to become a star in a modest country. He started singing within the band Menudo, which has achieved great fame with them and spent the five years. And began singing in Spanish in 1990, then worked as a solo artist and began singing pop since 1991, where he issued his first song titled (El Amor), which is a mix in Spanish and English, and began after the issuance of his albums and began his fame increases, since released his debut album titled "Ricky Martin ". In 1998 he sang the World Cup football song (The Cup of Life), which had been a tremendous success. In 1999, after several albums in Spanish, he launched the first English-language album titled (also Ricky Martin), which included the song "Livin 'la Vida Loca". And achieved international fame through it. In 2005 he released his album (life). Throughout his career, he sold more than 60 million albums worldwide. In 1994, he starred in "General Hospital" in American television in the role of the singer Albortrickan. After the beginning of 2012 appeared Ricky Martin in a personal Spanish tutor the most exciting, "David Martinez" serial famous "GLEE", then seemed completely submerged in assuming other personal - Chi Gievara- in the revival of the Broadway in the play "Evita", which opened in the theater Marquis in Times Square and has been a tremendous success existence of the greatest representatives participating in them. He is the founder of the Ricky Martin Foundation, a charitable non-profit organization founded to defend the well-being of children around the world in such an important social, education, health, justice and the fight against human trafficking areas. "Personality of the Year" award in recognition of the Latin Academy of Recordings artistic excellence and philanthropy on a large scale. He developed his "star" on the Hollywood Walk of Fame. Grammy Awards and three Latin Grammy Awards. Award from MTV Asia, MTV music in Europe. World Music Awards, the American Music Award. Many of the awards: "Premio Lo Nuestro", "Billboard" Latin. Premios Alma Award, an award from GLAAD.